(1516, Frank H. Reed Collection, OHS). 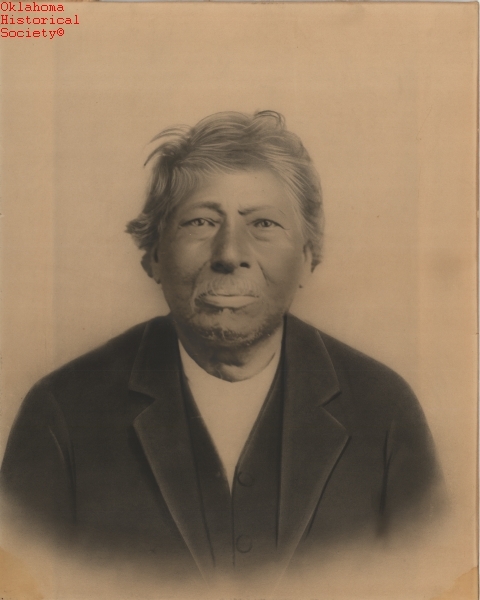 Chief John Jumper (Hemha Micco) of the Seminole Nation was born circa 1820 in Florida. Although his parents' names are unknown, he was a nephew of Micanopy. A member of the Baptist church, Jumper became an ordained minister in 1865. He served as the pastor of the Spring Baptist Church near Sasakwa in present Seminole County until 1894. Jumper fought against the United States during the Second Seminole War (1835–42) and arrived in Indian Territory as a military prisoner. He became the principal Seminole chief following the death of his brother, Chief James Jumper, circa 1849. In 1850 he led a delegation to Florida and encouraged the stalwart Seminole to remove west. As chief, Jumper supported the establishment of Presbyterian schools among his people, and he oversaw the founding of the Seminole Nation in 1856. In 1861 Jumper reluctantly agreed to an alliance between the Seminole and the Confederate States of America. During the Civil War he served as major of the First Battalion Seminole Mounted Rifles and as colonel of the First Regiment Seminole Volunteers. He participated in the engagements at Round Mountain, Chusto-Talasah, Middle Boggy, and Second Cabin Creek. Jumper represented the Southern Seminole at the Fort Smith Council of 1865 (the United States recognized the loyal John Chupko as the principal Seminole leader). Jumper was elected chief of a united Seminole Nation in 1882 and was succeeded by his son-in-law, John F. Brown, in 1885. John Jumper died at his home near Wewoka, on September 21, 1896. Frederick J. Dockstader, Great North American Indians: Profiles in Life and Leadership (New York: Van Nostrand Reinhold, 1977). Carolyn Thomas Foreman, "John Jumper," The Chronicles of Oklahoma 29 (Summer 1951). Carolyn Thomas Foreman, "The Jumper Family of the Seminole Nation," The Chronicles of Oklahoma 34 (Fall 1956). Arlene Hirschfelder and Paulette Molin, Encyclopedia of Native American Religions: An Introduction (New York: Facts On File, 2000). Jon D. May, "Jumper, John," The Encyclopedia of Oklahoma History and Culture, https://www.okhistory.org/publications/enc/entry.php?entry=JU002.